In the summer of 2009 the Arts and Heritage Center of North Augusta had its grand opening along with the new City Municipal Building. The Mayor and Council had responded to advocates for the North Augusta Cultural Arts Council and the Heritage Council and agreed to allocate space for arts and history exhibits. The beautiful space with ample galleries was poised to display local artists and to venerate local history, educating the community and celebrating the quality of life that North Augustans enjoy. The AHCNA Board of Directors formed a non-profit organization which had been at work since 2007 planning the design of the space. The Artists’ Guild joined in as a partner and local artists were delighted to have a place to showcase their work. Funding was secured from supportive residents and model artists were hired to create the circular diorama of North Augusta in 1910, a favorite of visitors. Items for sale in the gift shop gave artisans a marketplace for their work. Lauren Virgo, a native, was hired to be the first Executive Director. The regional history interpretive center, “Rivers, Rails, and Roads,” was moved here in 2011 from another SC Tourism location after it was awarded to the AHC and the City by state government. For the first two years this space held exhibits researched and prepared by cooperative and knowledgeable local history buffs. Some of the memorable exhibits that patrons enjoyed were History of the Schools and Churches; evolution of the Lions Club and Garden Clubs; history of entertainment and Palmetto Park and Pond; Wedding Dresses Through the Years; World War II and more. The Hampton Terrace Exhibit which recreated the lobby of the Hampton Terrace with vintage furnishings and culminated in a formal Gala was one of the most popular. Several notable accomplishments from the first years have continued to be hallmark events. AHC is a host stop on the Tour of Homes sponsored by Beta Sigma Phi. The River Days fundraiser (now Paint Your Palate) is important for financial support of the Center. 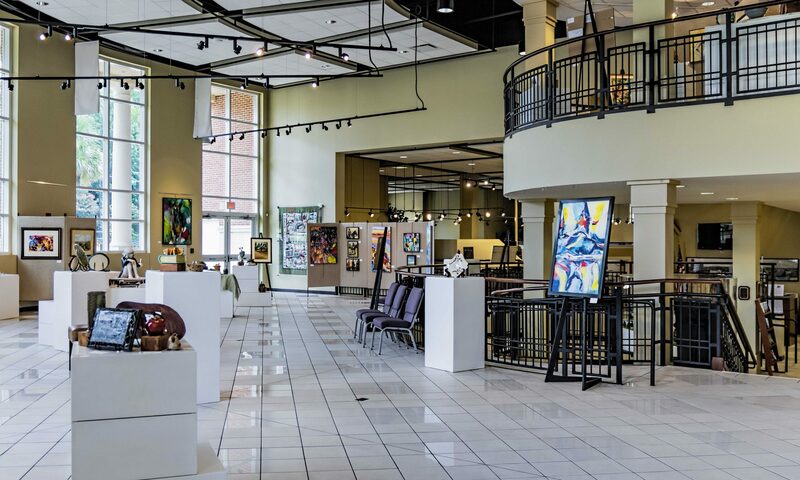 NACAC Springfest Art Show, the local schools Student Art Show, Clay Artists of the Southeast show, and NAAG Fall into Art Show are well-attended recurring exhibitions. Annually the birthday of the Center is celebrated with a reception. 2019 marks the 10th Anniversary of the AHCNA!